I’m sure many of you are familiar with the term Cheerleading, right? But how many of you truly know what this sport involves? Where it originates from? and how much time, energy and commitment cheerleading athletes dedicate to the sport they love? Well, if you’re cheerleading knowledge is a little hazy, stick around, as we’re about to take you on a little trip down memory lane – cheerleading style. Wait – it’s men only!? It’s 1884 and the American Princeton University football team had sorely been accepting defeat all season. In a bid to boost morale of both the team and crowd, Princeton University introduced a catchy cheer to be chanted at every game. I know, it’s no infectious jingle right, but it did the trick. A decade later, Princeton graduate Thomas Peebles introduced the ideology of chanting to a crowd of spectators at Minnesota University. On November 2nd, 1898 Minnesota student Johnny Campbell lead an organised cheer at a football game, ironically held between Minnesota and Princeton University; lo and behold creating the first ever ‘cheerleader’ and yes… he was male! With males dominating the chanting sport for over a decade, it wasn’t until the 1920’s that women became involved in Cheerleading; mainly because the amount of intercollegiate sports available to them in America at the time was almost none. The female chanters sported ankle length skirts, varsity sweatshirts and fuelled popularity for the sport. As a result, US female squads began to flourish, they also started integrating additional elements of gymnastics, dance and stunts into their routines. Pom-poms were introduced in the late 1930’s and in 1948 the first US National Cheerleading Association was born. By the 1960’s just about every American high school and University had cheerleaders. By the 1970’s cheerleading had taken on a new lease of life after The Tile IX rule was passed, allowing females to compete in the sport they had been dominating for 40 plus years – yay, go us! Cheerleading as we know it today really began in the 1980’s (comprising of flashy dance routines, gymnastics and stunts) and in 1997, cheerleading was recognised in the US as a National Competitive Sport, attracting international attention. After the success of US competitive Cheerleading, the sport can now be found globally, with a whopping 82 countries now participating, including Great Britain. Although deemed the ‘fastest growing sport in the world’ critics continue to claim that British cheerleading isn’t yet classified as a ‘sport’. Outdated views show that many still believe it to be the waving of, yes you guessed it… pom-poms! However, I’m sure you’ll agree that those who participate, believe modern cheerleading is a lot more ‘sporty’ than many other sports out there. Figures from the Department of Education show that 37% of schools in the UK now offer cheerleading in PE lessons and both independent and University squads have seen an increase in members as high as 87%. Despite significant growth coaches are continuing to blend athletic disciplines with complex acrobatic routines to ensure that cheerleading is recognised as a UK sport; a sport that demands strength, flexibility, dedication and above all, teamwork. While all competing athletes are judged competitively on their ability to perform seamless and perfect routines, athletes also take just as much pride in their squad’s appearance – you’ve got to look the part, right? I’m sure you’ve all noticed there’s no US inspired ankle length skirts and varsity sweaters around here anymore! 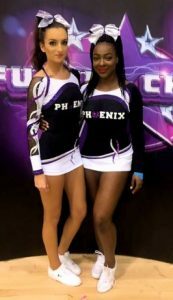 As a UK cheerleading uniform manufacturer, we understand the importance of appearance to any cheerleader. 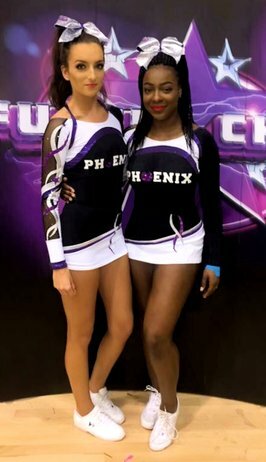 We recognise the hours, days and weeks of tough training squads put in before competitions and as a result, our philosophy is to ensure that all cheerleading uniforms match the dedication, hard work and fierceness of the athletes wearing it. If you’re looking for a new squad uniform or to simply revamp an old one, PINKfudge can guarantee that you’ll feel like a winner before you’ve even stepped on that competition mat! Give us a call on 01256 346255 or email us on sales@pinkfudge.com to discuss designs, prices, training wear and much more.